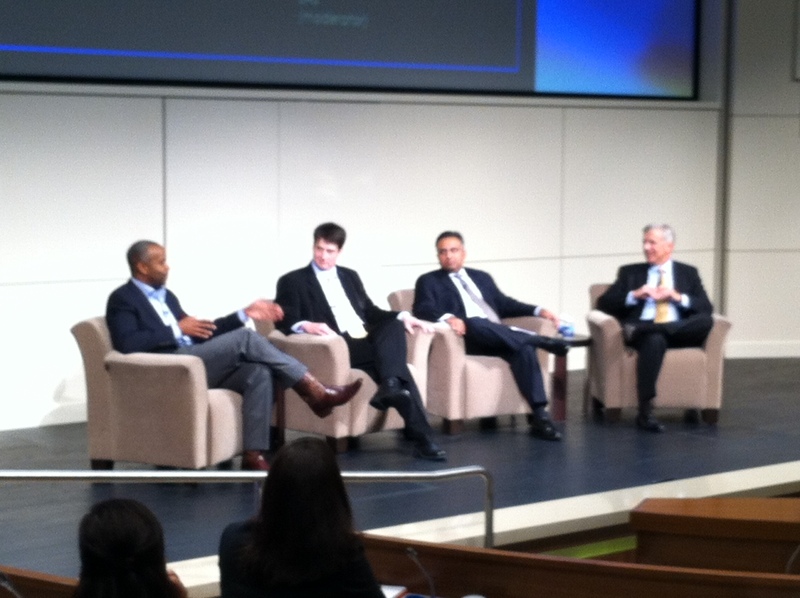 Executives from Bank of America, USAA and the United Nations discuss big data. Yesterday’s SAS Financial Services Executive Summit included a session titled “Big Data for the Next Big Idea,” which was moderated by SAS CMO and EVP Jim Davis , and included executives from organizations whose size tells me these people know exactly what big data is: Aditya Bhasin from Bank of America, Robert Kirkpatrick from the United Nations and A. Charles Thomas from USAA. And not coincidentally, each of these executives have responsibilities for areas that depend heavily on customer data – the core of the big data challenge. Jim began the session by sharing that everybody has their own definition of big data, but one common theme is that it wouldn’t be big data unless it represented some form of an obstacle. Generally, it can be considered data that has gotten so large that it’s grown beyond the capabilities of the relationship databases in use and the processors to capture, store, search and analyze the data. And to solve big data, leading organizations are increasingly turning to High Peformance Analytics. With 57 million customers, 29 million online banking users and 10 million mobile banking customers, Bank of America (B of A) has a relationship of some sort with 1 out of 2 customers in the Unted States - and they certainly know big data. For all those customers, they now hold about 65 Petabytes of data, and he confided that they probably use only 1% of it for analytics. Even so, imagine try to understand your customer segments when your 57 million customers are spread as far geographically as they might be in terms of preferred channels, usage profiles, credit worthiness and any number of factors. Clearly segmentation is not a trivial matter for B of A. At the United Nations (UN), Robert Kirkpatrick is the Director of Global Pulse, which was launched in response to the 2009 global financial crisis. The UN observed that globalization has interconnected economies and people such that financial system shocks anywhere in the world can reverberate in ways that start unraveling decades of forward progress in combatting hunger, providing healthcare, etc. They use social media analytics to predict unemployment spikes just from the “mood” in social media. (How cool is THAT?) Two of the biggest social media platforms are Facebook and Twitter. Now that Facebook has over 900 million users, and Twitter has over 140 million users generating 340 million tweets daily, is this a big data issue for the UN? Of course it is. Charles from USAA spoke to the challenges of providing world-class service to its customers spread around the world at a time of great flux. USAA currently serves about 9 million members, and has recently expanded its focus to serve all military personnel and their families. With that change in scope from their original focus on just officers, that massive expansion in scope alone will bring big data challenges. Some of their members are on active duty at the four corners of the globe, or many of them may be in transit between assignments. They’ve responded with a strategic priority to develop an analytic culture, while trying to emphasize foresight and “what if” scenarios over historical review. The USAA focus on analytics has meant a cultural change where they’re developing analytical skills across the enterprise. Aditya described a merchant-funded rewards program that B of A has rolled out called BankAmeriDeals. For customers that opt-in, they can have merchant deals offered directly to them and loaded onto their B of A card. The merchant wins because they benefit from data and analytics they do not have access to, and B of A benefits by cultivating preference and loyalty with both merchants and end customers. It’s potentially a very rewarding customer experience, but let’s conisder those millions of customers, multiplied by the number of retail institutions that take card transactions and we can understand once again how customer loyalty is a big data issue. Companies that ignore big data will do so at their peril, considering how customer expectations for real-time relevance are driving the need for informed interactions with them. At the same time, marketers face a real challenge to use customer and social media data while trying to avoid seeming creepy to customers. It’s a balancing act that will probably need to be struck by invoking the art of marketing while applying the science of analytics. The New York times article about the experience of uber-retailer Target is a great example of this situation. All panelists agreed that some element of being able to demonstrate to individuals that there is a benefit to allowing the analysis will be important to help strike that balance. In the broader context of a customer relationship, and with responsible use and maintaining transparency and authenticity, we may find that peoples’ definition of “creepy stalking” changes over time. Until then, we'll have to keep balacing. No matter what, the realities of big data are not going away and marketers would be remiss to forgo the value in tapping in to all available customer data to be better marketers. For more details about big data, check out this great post by my colleague Alison Bolen summarizing her posts about big data by industry and by role. That’s my two cents on big data. I’m curious to hear your take on it – please let me know!